The bound variable(s), which is the aspect of the game object, visual effect or sound that is going to change over time – for example the bound variable could be an x or y co-ordinate (or both) of a sprite, the sprite frame number (to animate sprites which have several frames, eg. an animated GIF), a palette/colour code for an object or visual effect, the rotation angle or scale factor of an object, the volume of the currently playing game music (for fades), or any other variable you can think of. The animation function, which specifies an equation describing how the bound variable(s) will change over time. This can be as simple as a linear equation – “move 100 pixels per second” – a sine or cosine function for fluid and smooth acceleration and deceleration of an object or to make wavy lines for example – or something as complex as a bezier curve, polynomial function or even a random number generator for static, distortion and certain particle effects. Don’t worry if you’re a bit confused right now; examples of how this all hangs together follow below! Animations that run constantly in the background (that is to say, they run continuously, not that they are actually in the background of the scene) – let’s be wildly creative and call them background animations – can be easily shoehorned into your game. All you have to do is add code to your per-frame game world update function to move the animations forward one frame, looping or cycling when you reach the end of the animation. Triggered animations happen as a result of something that happens in the game – perhaps triggered by the user, perhaps not. The implementation is similar to background animations except that you must first check if the animation is active (currently running or not), maintain a flag for this, and turn it off when the animation ends rather than looping it. Some types of animations will actually alter the flow of execution of the game, and these are by far the most complex to implement. 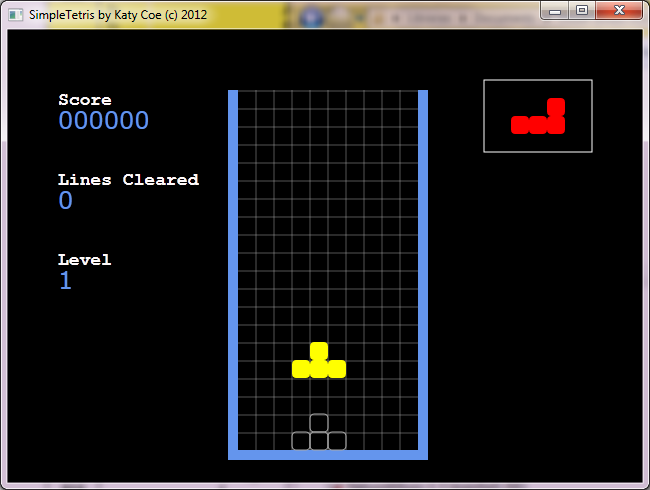 For example, in Tetris, when a line is cleared, you may want to fade the line out. For reasons of consistency, the rest of the game update engine should be paused while you do this, because you are now creating a state where essentially one row is empty but the other blocks haven’t fallen down yet – an essentially illegal game world state in Tetris. This situation will continue for a number of frames, and only once the blocks have been re-positioned correctly should the next piece fall. If you don’t do this, and the bucket is nearly full, the player can lose the game unfairly as a new piece comes tumbling down before the previous line clear animation has finished. Depending on the code implementation, the collision detection may also be off by one row in the bucket. These kinds of animations – which I’ll call intrinsic animations – require changes to the game logic and are much harder to just throw in later as an afterthought. Figure 1. Variable-width characters being animated in a sine wave (the text moves up and down according to the sine wave function). The position of the first character is calculated directly from the result of the animation function (sine). The remaining characters are calculated by applying an offset to the animation position relative to their X co-ordinate. In the examples below, you will learn simple practical ways to do this calculation using timer functions, and apply it to different kinds of animation. Tracking the position and timing of animations is cumbersome so it would be nice to hide all this away in a class that does it for us. Simple2D includes a trivial animation class with which you can provide in the constructor an animation function and a number of other parameters, and the object spits out at any given moment the current result of the animation function based on the time interval you specified (the length of time it should run). These functions are provided a value from 0.0 to 1.0 indicating how far into the animation we are, and return a value from -1.0 to +1.0 indicating the actual result of the animation function. The 1st parameter is the animation function, the 2nd is how many milliseconds the animation should run for, the 3rd is the ‘amplitude’ which is a multiplication factor applied to the result of the animation function, the 4th is the ‘base’ which is added to the result of the animation function (after multiplication) – useful when you want an offset other than zero – the 5th is the cycle type which specifies how you want the animation to loop or repeat (see code extract above), and the 6th specifies whether to start the animation timer immediately or not. You retrieve the current position in the animation by calling GetAnimPos() and the current result of the animation function by calling GetAnimOffset(). Note that the 300 in the 3rd parameter specifies the distance the rectangle should move in total. Calling anim.GetAnimOffset() will over the course of 3 seconds from the moment the constructor was called return values from 100-400 in a linearly increasing fashion. What happens is that the 0.0-1.0 result of Animations::Linear() is scaled by 300, and added to 100, giving the desired range of X values. This is a simplified version of the full code in Simple2D as it offers other features and methods. The main work is done in the first line of GetAnimPos(), which calculates the time elapsed (in milliseconds) since the animation began, then divides it by the desired animation run-time to obtain the percentage (in decimal, ie. 0.0 – 1.0) specifying how far through the animation we are. The remaining lines simply implement the logic for the cycle type. The result of this function is then passed to the specified animation function in GetAnimOffset(), multiplied by the desired amplitude and added to the base value, to get the final result of the animation function. These are the only changes needed. 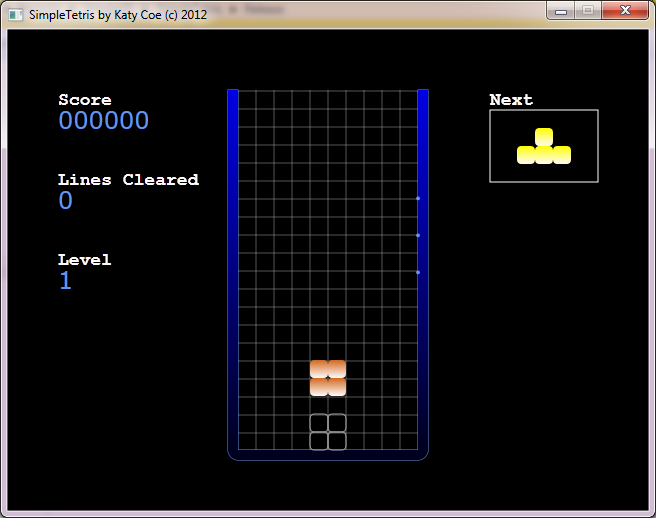 With all of this in mind, let’s now turn to practical uses and examples from SimpleTetris. Goal: Make a series of dots move repeatedly around the edge of the bucket at a linear speed, with the speed increasing every time the player levels up (it is best to try the game to understand this better). First, we make a linear animation with no time length (this will be decided later as it depends on the player’s level), and an amplitude equivalent to the number of pixels length the bucket geometry would be if it was stretched out into a single line. This handy GetLength() function is provided by Direct2D. The for loop runs three times (with 0.00, 0.02 and 0.04 as values for i), using these values as an offset into the animation function relative to the current position in the animation. The code is a little awkward but Direct2D’s ComputePointAtLength() returns in screen co-ordinates the pixel on the geometry outline at a length along the geometry specified by the first parameter – which here, we set to the result of the animation function (offset by i). In this way, the dots travel along at a fixed distance from each other around the bucket. // Make tracers go faster! We merely subtract 1.5 seconds from the total traversal time per level (giving the appearance of more frantic movement as the player levels up more and more) using SetInterval() to adjust the animation’s interval parameter. Goal: We want the interior of the bucket to slowly undulate with a vertical graduated fill from blue to black (or a darker blue) that moves gradually up and down the bucket interior over a period of time, to give the appearance of a smooth palette animation. Additionally, we want the overall colour to become more red as the bucket becomes more full, indicating danger of the game ending. The red saturation is increased (multiplied by usedPc) the more full the bucket is, whereas the blue saturation is decreased (multiplied by 1 - usedPc) in the same circumstances. As the bucket empties and usedPc decreases, the blue saturation outweighs the red saturation and vice versa. Goal: It is very common in games to quickly flash up the number of points earned when you destroy an enemy or achieve some other trivial task, next to the location on the screen where the points were earned – eg, over the enemy’s head or near a line clear in Tetris. We can achieve this with a simple class which fires off these throwaway animations as needed. There is a slight gotcha here to be aware of: there may be more than one of these animations taking place at once, especially in a fast-moving game where you are mowing down waves of enemies in quick succession. Therefore we need to keep a list of each activate point display animation, render them all, and throw away any that have expired as and when needed. This is the main challenge with this type of animation where there can be more than one active at a time, and where it differs from the previous examples. In the game update code, when one or more lines have been filled, we first calculate how many points have been earned and then add a new ScoreAnimation to the vector of active animations, passing to its constructor a reference to the shape that caused points to be earned; we need this to calculate the starting position of the points text, as we are going to make it initially appear above the shape that caused the points to be scored then drift upwards and fade out, so we need the shape’s co-ordinates. We calculate the top-center pixel of the shape which caused points to be earned using some application-specific jiggery-pokery, then make the text which will look like “+50”, “+1000” etc. This uses a non-monospaced font so we must then calculate the width and height of the text and adjust x and y so that the top-left position of the text plotting co-ordinates will cause the points text to appear directly over the center of the shape. Finally, we create a linear 1.5-second animation with an amplitude of 1.0 and no base offset. The animation will therefore last for 1.5 seconds. Note here that the single animation function is used in two ways – first in reverse to calculate the amount of transparency (from 1.0 – 0.0, in other words from fully opaque to invisible), then multiplied by 50 to gradually make the text drift upwards from its initial position. This is the reason that we just leave the amplitude of the animation at 1.0. Once again, I recommend you play the game to see this effect in action as it is not easy to describe in words. Note that we only kill off a maximum of one animation per rendering loop even if more than one has finished, because the vector iterator becomes invalid once you call erase(). This is basically a fudge for laziness, but as it happens, all of the animations last an identical amount of time so a deque or list may be a better choice of storage container, with a list having the particular advantage that erasing does not invalidate the iterator. Goal: Another common feature of games is not to simply update the displayed score when points are scored, but to animate it by displaying a number of intermediate values (scores) between the previous score and new score to give the satisfying effect of “racking up points”. For example if your score is 100 and then becomes 200, we might want to display 110, 120, 130 … 180, 190 in successive animation frames before displaying 200. I will call this a rolling score animation. This kind of animation poses a few small challenges: first, the displayed score might not be the player’s actual current score, so we will supplant the normal score rendering code with a new score rendering function that can handle this. Second, more points may be earned while the score is still animating, so we need to be able to queue up additional points in a list so that they don’t get lost or the animation corrupted. Third, we cannot use a fixed linear increment to interpolate between the scores when points are earned, because earning 1,000,000 points would then take 1,000 times more frames to animate than if we scored 1,000 points, say. Instead, we decide on a number of steps to use between the scores (for example, 20), and interpolate a total of that many steps. Finally, we need to update the displayed rolling score every X frames (say, 2 or 3 or 4), so we need to track time just as in the other animations. We use a deque to store a list of scores to display, because it supports linear-time pushing and popping of values from each end, which is exactly what we need: new scores will be pushed onto the end of the deque, and the oldest score in the list will be popped from the front. When following along below, understand that the deque will not only contain newly earned scores, but also dynamically generated interpolations between previous scores and new scores which are pushed onto the deque in advance whenever the player’s score changes, such that the rendering code can just pop the first value off the deque and display it, creating the rolling effect. The lastRollTime variable will store the value of GetTickCount() from when the value of the displayed score was last changed. We reset this to the current time every time we display a new value, and this lets us track how long has elapsed since the change so that we know when to advance onto displaying the next score. If a new game has just started, we simply reset everything, emptying the deque, setting the displayed score to zero and so on. Otherwise, we first look at the deque, and if it is empty this means that we are displaying the current (now previous) latest score already, so we alter lastRollTime to make the animation of the new score we were just supplied with in newScore commence immediately. Next we calculate in initialScore the lowest score which is greater than the current (now previous) latest score. If the deque is empty, this will be in score, otherwise it will be the final (most recently added) entry in the deque. If the increase in score is small (here, less than 50 points), we don’t bother to animate it at all, and just add it as a single entry to the end of the deque (the drawing function, as we shall see below, does not animate the score if the deque only contains one item). The reason we do this is because we only want the animation to play out when the player has scored a significant number of points. This can be tweaked as you prefer. First, we choose how many steps of animation (how many different interpolated scores) we want based on the number of points just earned. In this example, we use 10 steps for 500 points or less, 20 steps for 5000 points or less, otherwise 40 steps. avgStep will end up containing the number of points to increment the old score by such that after the desired number of steps, it will equal the new (desired, final) score. For example, if the player scored 150 points, this will execute in 10 steps, and avgStep will be 15. Immediately we can see a problem as 2151 is higher than the target score, so we introduce a condition to only push the score onto the deque if it is less than the target score. After the for loop, the actual target score is pushed onto the end of the deque to make the animation finishes by displaying the correct value. First of all, if the deque is empty, then there is no rolling animation going on at the moment so we just display the score as normal. If the deque contains items, we first check if a specific time (in this case 40ms) has elapsed since we last popped a value off the front and updated the displayed number. If not, no changes are made, otherwise we get the next value to display from the front of the deque, remove it, store it in score and reset the timer to run for another 40ms displaying this new value. Notice that when the final item is removed from the deque, the inner if condition becomes false and the animation stops. If we didn’t do this, adding small scores where we don’t want any animation would cause a brief flicker as the rolling animation runs for a single item – so we never animate when the deque only contained one item. And the rolling score animation is complete! Goal: When the player clears a line in Tetris, we want to animate the line clearance with some kind of fill or fade before the line disappears and the pieces move down. We cannot have a situation where there are one or more empty lines on a Tetris grid because this is an illegal game state. We cannot move the pieces down in memory and fake their position on-screen because this will break the collision detection. We cannot allow a new piece to fall while the animation is taking place because it may collide with another shape at the top of the bucket and cause the game to end unfairly. The solution is to essentially pause the flow of the game (without actually entering the player-triggered pause state) until the animation completes. Note that in the silhouette rendering, we find the silhouette position by arbitrarily moving the shape as far down as it will go. This will always trigger a collision that will de-activate the piece, so we have to turn it back on as a fudge (the piece is then returned to its proper position after rendering the silhouette). TetrisBucket::Add() previously placed the piece in the board, counted the number of filled lines (and which ones), re-ordered the bucket to remove them and updated the player’s score and level. The logic now changes: we still place the piece and detect filled lines, but now we store a list of filled lines in an array to be used in animation. If any lines have been filled, we trigger the animation and set animating to true, otherwise we set wantNewPiece to true if no lines have been filled and the game proceeds normally, with a new piece being immediately generated and activated (this happens on the next frame when UpdateBucket() returns true, causing newPiece() to execute, which remains unchanged from before). The dirty work now goes in UpdateBucket which essentially does nothing if there is no animation in progress, but when a line clearance animation ends, it takes the responsibility of updating the bucket to remove empty rows, the player’s level and score and turns off the animation, setting wantNewPiece to true and animating to false. In this way, the bucket does indeed contain empty rows while the animation is in progress, but no new shapes are generated and the player has no control over any shape until the animation ends. The player’s score and level are also not updated until the animation ends, although that is the designer’s option. What we are doing here is plotting a rectangle over the top of each filled line (up to four – the maximum amount it’s possible to clear in the placement of a single piece), starting with an alpha level of 0 (completely transparent) and ending 250ms later with a level of 1 (fully opaque). It then abruptly disappears, taking the empty row with it. There are a few simple graphical changes we can implement to make our game a bit more professional and user-friendly, so let’s finish by taking a look at these. The two-parameter version of Simple2D’s MakeBrush() creates an even, vertical graduated fill between the two specified colours (if you want a horizontal, diagonal or custom fill, the 3rd parameter can be used to specify this). No other code changes are needed, we are simply changing the Direct2D brushes used to render the blocks. First we create a new geometry with the starting point at the top-left of the bucket. The next four lines add the left-side, bottom left corner (which we define as an arc), bottom-side and botto right corner (another arc). The rest of the geometry is just straight lines to fill the inside of the bucket, so we just use a shortcut of placing the list of points in an array and adding them all to the geometry in one go with AddLines(). We first draw the bucket outline, then the bucket fill, using two different brushes so that the outline can be a different colour to the interior. Next time, we’ll look at adding background images, music, sound effects and an intro sequence to our game to round off the single-player experience.